Part of the process of making a video about the Nintendo GameCube is capturing a lot of GameCube footage. In this instance, I found myself trying to get a shrine in Super Mario Sunshine for the first time in a decade. Another new video next week! 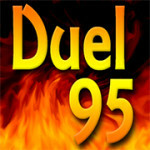 © 2004-2017 Duel 95 Professional. All rights reserved.